Save time scooping. Enjoy a happier cat & a fresher home. Give your cat a litter box that's always clean. The bowl continuously cleans by constantly (and slowly) rotating. The bowl makes one full rotation per hour, moving litter toward the ramp. Clumps move up the ramp and conveyor belt into the waste bin. Line the waste bin with a trash bag for easy cleanup. 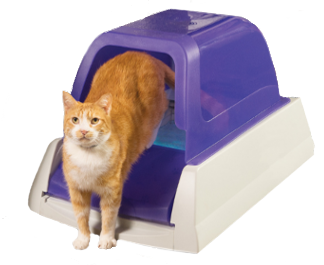 ScoopFree litter boxes automatically rake your cat’s waste into the covered trap. 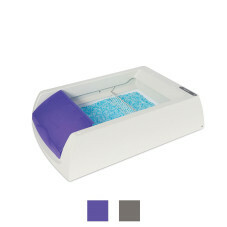 The disposable litter tray is filled with crystal litter that destroys odor-causing bacteria. You and your cat will enjoy a better smelling home without the need for daily scooping. The Simply Clean is the only cat litter system that cleans and removes waste continuously and automatically. 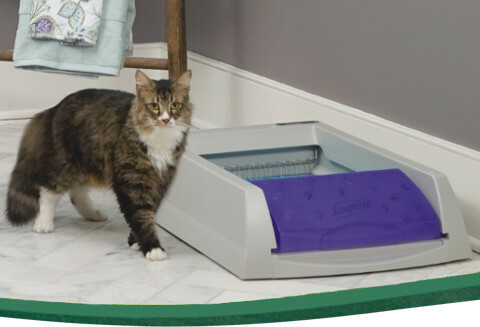 ScoopFree self-cleaning litter boxes provide the ultimate in convenience. 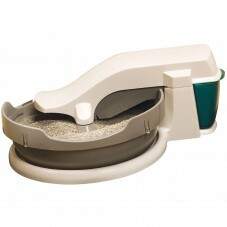 Simply load the disposable litter tray into the litter box base. 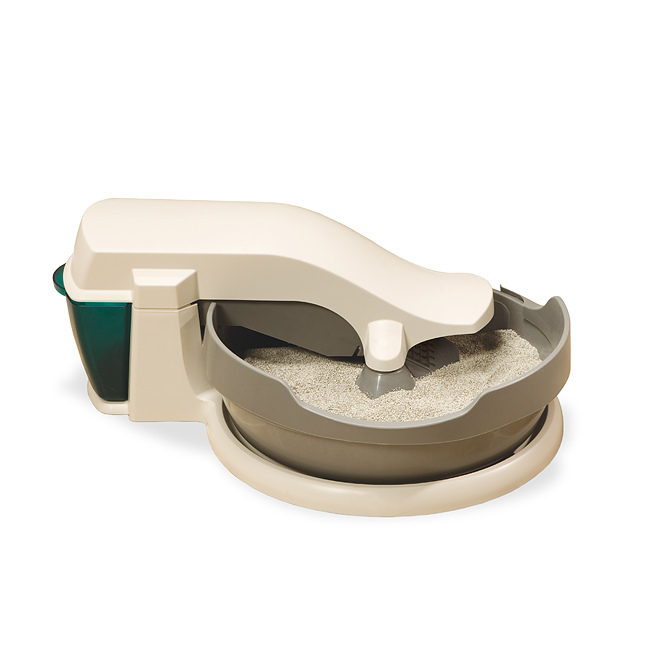 The ScoopFree automatically sweeps away waste after your cat uses the litter box. Throw out the litter tray and replace it with a new one every few weeks. You won't have to scoop, touch, or smell messy waste again. With new autoship litter tray subscriptions, you can get fresh litter trays delivered to your door automatically. Choose when you’ll receive each shipment and how many trays you need. Free shipping and 10% discount included! 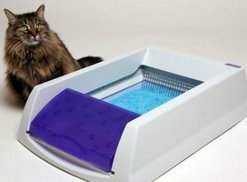 Disposable trays mean no more touching or smelling your cat's waste. Low-dust crystal litter absorbs urine on contact and dries solid waste. 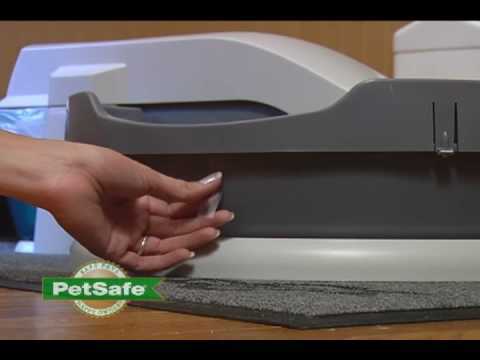 Low-tracking granules are softer on paws. Premium Blue Crystals reduce odor 5 times better than clumping litter. Keeps cats happy & prevents accidents with a quiet box that's always clean. 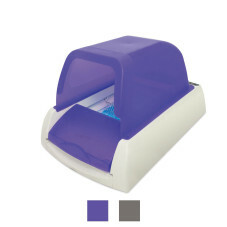 1 tray lasts up to 30 days for 1 cat, 15 days for 2 cats, and 10 days for 3 cats. How many cats per box? Does the Simply Clean use more litter? Will my cat fit in the box?